Unlike many of the other buildings mentioned here, it is not likely that this one will be demolished anytime soon. 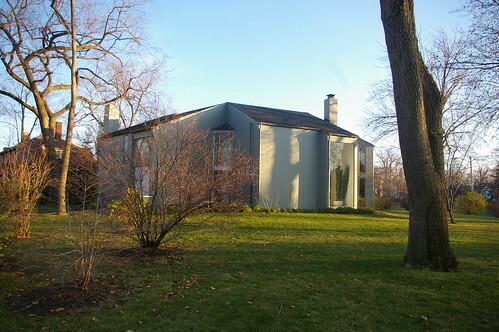 The house, at 14300 Drexmore Road, in Shaker Heights, was built in 1967 by architect Don M. Hisaka as his personal residence. 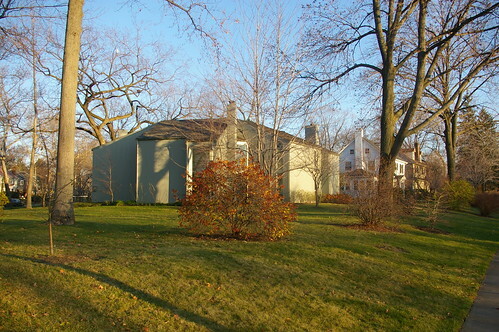 It recieved the American Institute of Architects Honor in 1970. Hisaka also won the Cleveland Arts Prize for architecture that year. Other Cleveland buildings designed by Hisaka include the atrium connecting Thwing and Hitchcock Halls at Case Western Reserve University and the University Center at Cleveland State University, which was demolished in 2008. 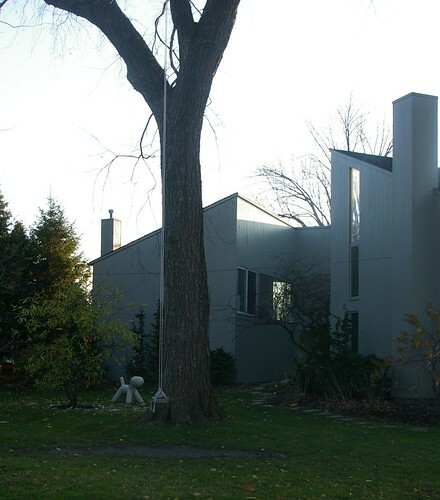 The house is built on a skinny, triangular lot at the intersection of Coventry and Drexmore. 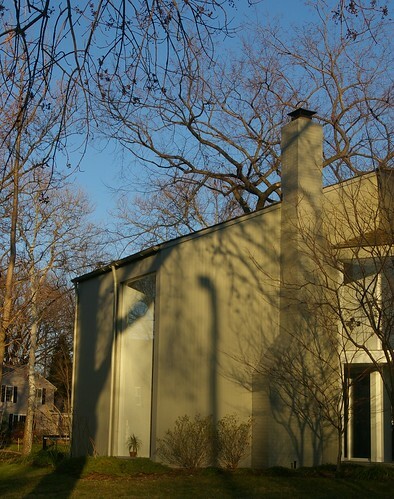 The layout of Shaker Heights makes for quite a few lots with these proportions. They've been perieved to be of lower value, due to the difficulty of building on them. Many are occupied by duplexes, presumably due to the lower value of the land. Hisaka saw the potential for this space and created a house that fits it quite well. 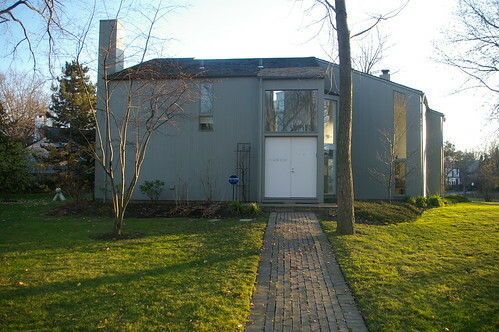 Hisaka had to deal with the restrictions associated with building in Shaker Heights, which tended to cause other progressive architects to look further out when choosing a site on which to build. The house fits in quite well with the neighborhood, I think. The house is made of four rectangular blocks, enclosing a pentagon-shaped courtyard. With the exception of the one shown here, windows on the blocks tend to be long and skinny, allowing for more privacy. As the house has no real back yard, this is critical. Windows on the sections joining the block are larger. The house is presumably illuminated by large windows on the courtyard. Somehow, it fits into this neighborhood where most of the houses were built in the 1920s. At one point I would have suggested that it is the materials, but few houses here use cedar shakes on their roofs anymore, and none have half-round gutters. The interior courtyard allows this house to succeed where so many of the duplexes in the neighborhood fail. The triangular lot doesn't allow for much, if any, back yard. What little back yard space there is lacks privacy. We considered one of these duplexes quite seriously, and it seemed the only way we could really make the yard ours would be to plant massive hedges. An interior courtyard is a much more reasonable approach. Each of the four blocks has a chimney, adding a visual theme that helps tie them together and break up the shape. Three of the four are sided in the same manner as the rest of the house. One, on the block with the entrance, I suspect to be merely for aesthetics. I wonder whether this one was painted originally. Even the garage seems to fit in well with the house. I am curious about the sliding door on the second floor. I doubt it was intended for a balcony. Was it just a cheaper way to replace the windows? Second floor on garage was added later. 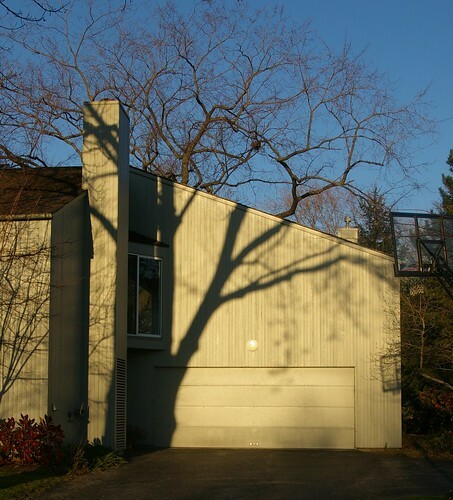 The sliding glass door was created as a passage to the office loft over the garage. Narrow - tough to get furniture through. Interesting. It makes the interior courtyard feel a bit more private, too, I susppose - though, I have to imagine, there aren't that may 12 foot tall people walking by and looking in. I was a visitor to the Hisaka residence many times in the seventies. The "interior" or courtyard-facing sides of the house was virtually all glass, both on the first and second floors and let in plenty of light. In the center of the courtyard, an crab apple tree was planted, which was covered in small lights in the winter. The lights reflected on all the windows and the Hisakas said drivers would go back and forth trying to figure out where the lights came from. The room above the garage was added later for Mrs. Hisaka to use.